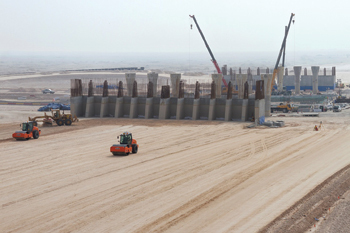 Bridge construction works are progressing at Al Wakra Bypass Interchange, part of the East Corridor project. Qatar's Public Works Authority (Ashghal) ambitious Expressway Programme, which comprises a thousand kilometres of roads and hundreds of bridges and interchanges, has seen significant progress over the past year. The programme comprises more than 30 projects divided into 46 contracts with the total value of projects currently under construction estimated at QR40 billion ($11 billion). It is expected to deliver about 1,000 km of safe and efficient roads, in addition to 360 bridges and 240 interchanges, which will provide vital transportation links across the country, connecting cities, towns and urban arterial routes. The Expressway Programme also entails the construction and development of an integrated infrastructure network equipped with state-of-the-art, reliable underground utilities, including stormwater networks, electrical services, and intelligent transport systems. Additionally, the programme will include extensive beautification schemes, while ensuring enhanced facilities for cyclists and pedestrians. “These new projects will form an integrated road network that will connect all areas of Doha to accommodate Qatar’s future traffic demands and, as the projects progress, their positive impact will gradually be seen, notably in terms of having less traffic congestion and reduced journey times,” a spokesman for Ashghal tells Gulf Construction. There are currently 19 projects under construction while the remaining projects are still in design or will enter the procurement phase soon, he says. East West Corridor ... part of the Expressway Programme. A key component of the Expressway Programme is the East West Corridor project, in south Doha, which will connect the new Orbital Highway to the Hamad International Airport and provide strategic links with the southern part of the city. It is being carried out under two construction contracts – West Corridor and East Corridor, each comprising 11 km of dual carriage way – with one company contracted for the East Corridor and the other working in parallel on the West Corridor to accelerate the construction work. The nearly 22-km dual carriageway will feature five lanes in each direction stretching from west of Barwa City to Al Matar (Old Airport) street, south of the Air Force Roundabout. The corridor will include eight new interchanges that are expected to provide access to key roads and residential areas such as Al Matar Street, the Najma Street Extension, Barwa Access Road, and the new Al Wakrah Bypass. A 25-m-deep light rail tunnel ... part of the Lusail Expressway. 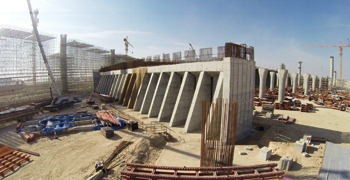 This project includes the reconstruction and development of the existing Lusail Road, starting from south of the Arch Roundabout to the North Canal Crossing, to connect the Lusail development area with Doha. The project will involve 5.3 km of four-lane highway in both directions and three major interchanges. “The expressway will also have two service lanes in the multi-level interchange areas, and include a complex network of tunnels, flyovers and junctions in order to meet the future traffic demands by providing easy and speedy connectivity. The expressway will improve interchanges benefiting the existing development areas such as the Diplomatic Area, the Pearl, Katara and nearby residential and business areas with better connectivity,” the spokesman says. Currently, Al Wehdah interchange will be developed into a three-level interchange with a dual three-lane underpass connecting Al Dafna area to Lusail. It will offer a single-point interchange at the ground level for the traffic from the Arch Roundabout and three-lane directional links from Lusail Expressway to the Central Business district. Around 3-km-long tunnels of 3-m internal diameter are being constructed for the conveyance of 132 kV cables. 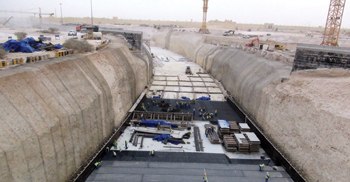 Around 1.2 km of tunnels of 2.5-m internal diameter are also being constructed for the drainage system. “One of the main benefits of these tunnels is that it allows underground maintenance works to take place without having to resort to the traditional methods – namely, deep drilling and traffic diversions. These tunnels also provide easy access to services and utilities to undergo maintenance work. 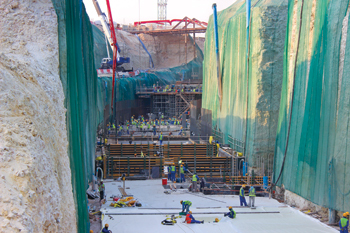 A 1.1 km tunnel that will be 9.5 m-wide and 5.5 m-high will also pass beneath the Pearl Interchange at a depth of 25 m to provide connection to the Light Rail Transit system. Dukhan Road East will have four lanes in each direction. Also part of the Expressway Programme, the Dukhan Road East project runs from the Bani Hajer Interchange (west) to the Tilted Interchange (east) and along Al Gharrafa Road from Al Rayyan Street (north) to Thani Bin Jasim Street (south). The mainline for Dukhan Road East consists of four lanes in each direction, separated by a median, with service roads and auxiliary lanes along sections of the road. This project, along with the Dukhan Highway Central project, will create a strategic east-west highway comprising four lanes in each direction and six multi-level interchanges.